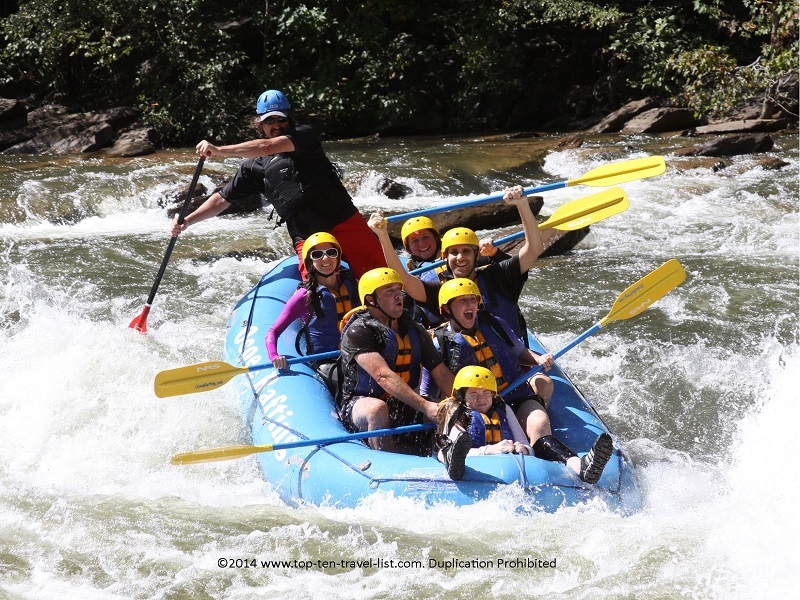 A Wild Rafting Adventure on the Ocoee River - Top Ten Travel Blog | Our experiences traveling throughout the US. Whitewater Rafting on Tennessee’s Ocoee River is a thrilling, once in a lifetime experience that should be added to everyone’s bucket list. It’s exciting, scary, fun, and demanding all at the same time! 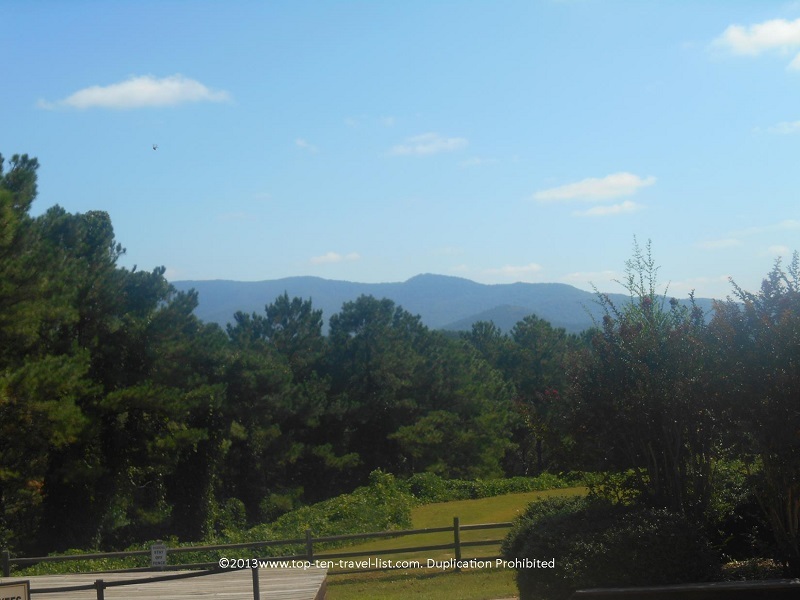 You also get to experience an incredibly scenic journey through the beautiful Southern Appalachian Mountains. 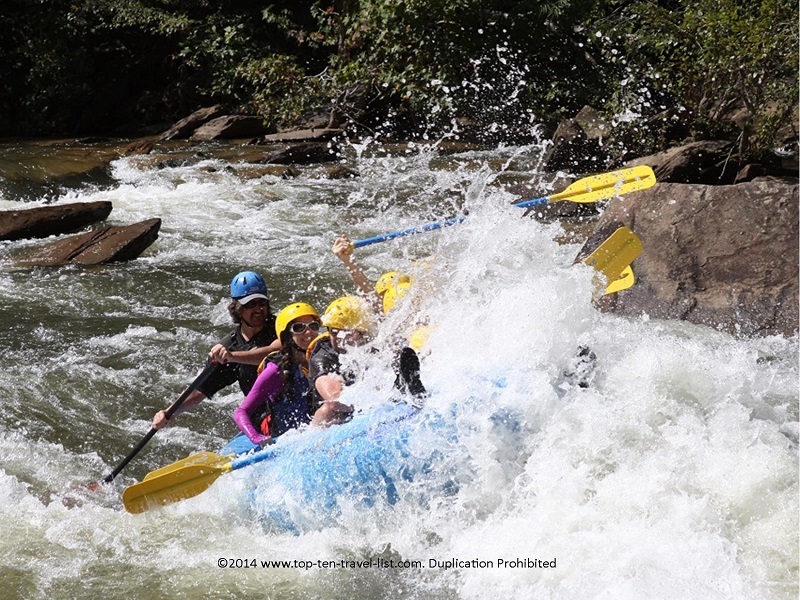 Wildwater Ocoee in Southeast Tennessee provides exiting adventures through challenging and exciting Class III and IV rapids. Your adventure will take you down the Upper or Middle Ocoee River, depending on which trip you decide to book. The Middle Ocoee River trip is an hour and a half journey through 5 miles of rapids with a drop of over 260 feet from beginning to end. Although a full 3 and a half hour Upper and Middle combo trip is available, I recommend starting out with just the middle section for beginners. This will help you get used to maneuvering the raft and getting used to all instructions. Plus, it’s a pretty challenging workout, so throwing yourself into an all day adventure on your first time out probably isn’t the best idea! All whitewater guides are highly trained and provide excellent instructions, both before and during your adventure. Be prepared for an exciting trip through Cherokee National Forest, filled with twists, turns, and slight drops. If you are new to rafting, it might be a scary experience. 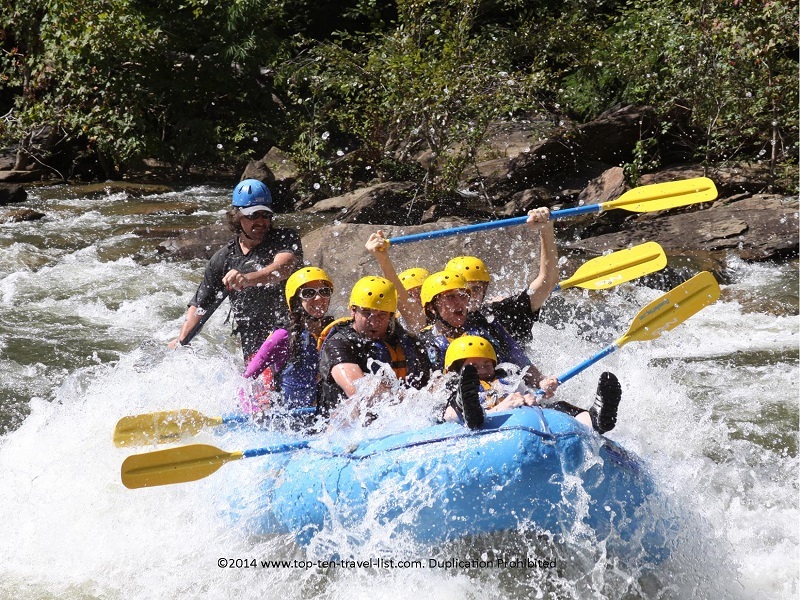 You may want to check out an introductory course at Wildwater Nantahala, a rafting center in Western North Carolina which offers family friendly trips through less intense Class I and II rapids. However, if you feel up to the challenge, Wildwater Ococee provides the best trips in the area. Canoe Magazine ranked the river as one of the 10 best for rafting. The 1996 Whitewater Olympic events (the first time the event took place on a natural river) were held here. I never felt unsafe on my trip. One of the most popular rafting companies in the US, Wildwater has been providing rafting trips since 1976 with an excellent safety record. The guides made newcomers feel comfortable and gave great tips and instruction along the way. Although I was a bit nervous to embark on my first rafting adventure, I felt that our guide provided a great introduction to the water despite the more challenging Class III and IV setting. I did fall in the water once, however, it wasn’t as bad as I thought it would be. Yes, it is more common than you think to fall in, so prepare yourself for the possibility. Be sure to follow all instructions in the case that the boat flips or you randomly fall out. Before your trip, you will be given all the necessary equipment which consists of: a life jacket, helmet, and a paddle. You will then be given safety instructions and a brief overview of techniques to use on the river. Next, a 15 minute bus ride will take you over to the river. The ride itself is pretty exciting with picturesque views of the mountains and river. You will be split into groups of 6 with one guide for each group (make sure you make your reservation together so you get put into the same group). Your guide will go over some basic instructions: how to hold a paddle, how to perform different strokes, how to position yourself in the boat, how to lock your feet in, and what to do if you fall into the water. It can all be a bit overwhelming to take in so much new information so quickly. Make sure to pay close attention. It will all seem much easier once you actually get inside the boat and your adrenaline starts kicking in. After a few short minutes of practice, you will carry the boat over to the starting point. Things get moving pretty quickly from here, so get ready. Be prepared to get absolutely soaked! Also be ready to listen and react quickly to the instructions from your guide. Be prepared to paddle quickly when instructed to do so. You will move around slightly in the boat due to the violent nature of the rapids. Our guide even switched things up a bit by having each group move to different sections of the raft. I have to admit I felt the safest in the middle section. The front is a bit more frightening as it is harder to lock your feet in, whereas while sitting in the other seats you feel like you can anchor your foot in due to the weight of the person sitting in front of you. It’s a frightening and exciting experience, but also a total blast. 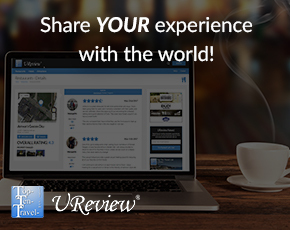 The guide will help you along the way, and even provide a little entertainment. Our guide seemed to be pretty knowledgeable about the river and rafting in general, was personable and funny, and gave a great overview of rafting to a party of all first time rafters. I feel like I learned a great deal about rafting by the end of our trip. 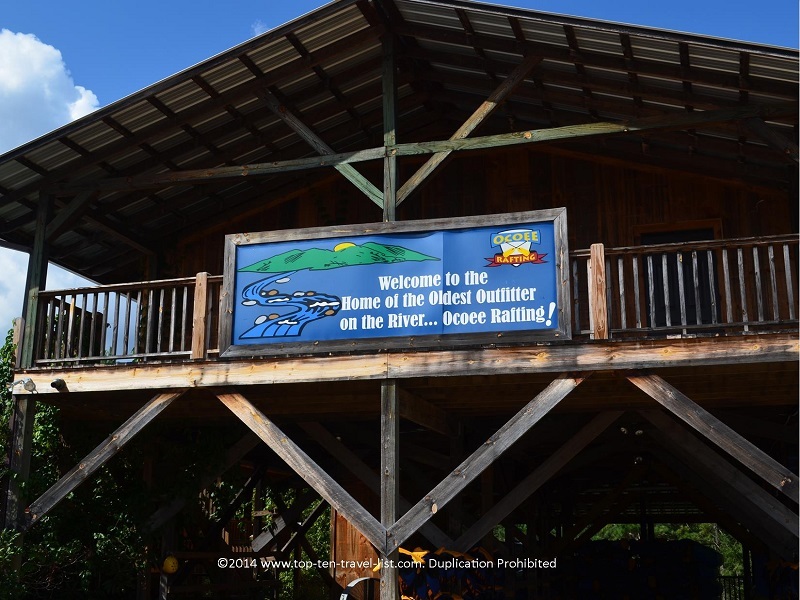 Our trip with Wildwater Ocoee was a wonderful experience. The best part of the trip was getting to raft through such a beautiful area of the country. The southern Appalachian mountains truly are beautiful. It was a picture perfect journey through the wilderness; one that I would definitely participate in again as well as recommend to others. 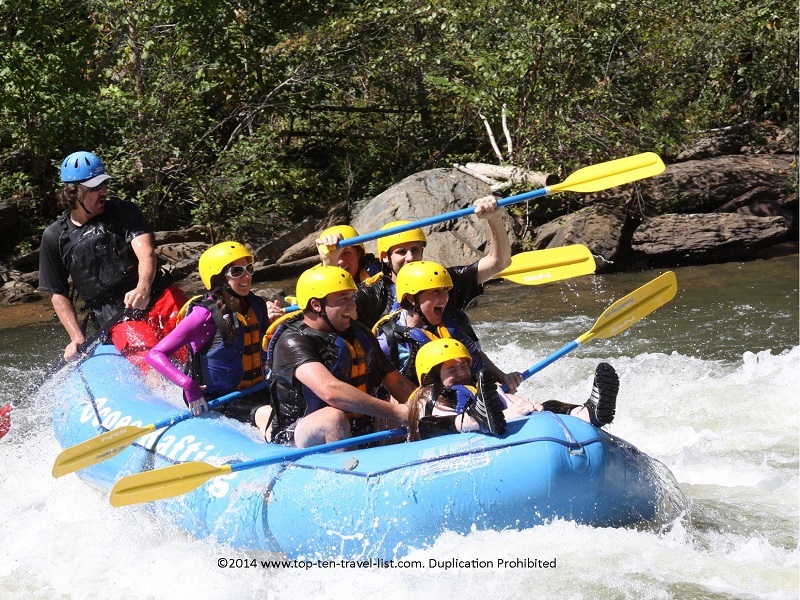 After your trip, you will be able to check out a few pictures of your group rafting along the river. Although they are a bit pricey ($40 for the full CD), in my opinion well worth it. During your adventure, your guide will let you know when your photo is going to be taken so you can prepare in time to look at the camera. I definitely recommend a whitewater trip with Wildwater Ocoee to any thrill seeker up for a great adventure. You will get soaked. You will take in fantastic views of the mountains. You will learn how to maneuver the raft. You will be challenged. But most of all, you will have an absolute blast! A rafting trip down the Ocoee River is the perfect addition to any Northern Georgia or Southeast Tennessee vacation. *Trips are only open to rafters aged 12 and up. This is according to Tennessee State Parks Department rules. *No sandals or bathing suits are allowed. I recommend workout clothes because they are light weight, quick drying, and easy to move around in. *No experience is necessary, however, there is a general risk whenever participating in an adventure activity. You will be required to sign a release. *Make sure you book all people in your party together to ensure you get put into the same group. They cannot guarantee a seat together unless you book together under the same name. *Wear waterproof shoes. My Barefoot Running shoes worked perfectly for the occasion. The gift shop has some waterproof shoes for sale, however, they are a bit pricey for a one time use. *Bring a towel and dry clothes to change into after your trip. There are really nice bathrooms and hot showers if you want to freshen up before going out to eat/engaging in other activities. There’s nothing worse than driving back to your hotel in wet clothes! *Wear sunglasses. It’s much easier to see what’s going on when you are not squinting. *Do not arrive too early. Get to the center at your trip time. It takes about a half hour to check everyone in, so if you arrive too early you will be waiting for a long time. Although the beautiful mountain views make the lengthy wait a bit more tolerable. *Properly secure your helmet and life jacket before getting into the raft. *Follow all instructions regarding how to properly hold the paddle. We were informed that most accidents occur when someone is not holding the paddle correctly! *Listen to all safety instructions very closely. Everything moves pretty quickly and then you are in the water right afterwards. *Drink plenty of water and eat something before your trip. The whole experience can take up to 4 hours including driving and waiting time. You will be hungry after your trip, hence, bringing the dry clothes. *Plan on an afternoon trip during the fall season. Mornings tend to be quite cold, especially when you get wet. Warmer, sunnier weather is preferred. *Get ready for an intense workout. A sore lower body from holding your body in a certain direction for several hours and sore arms from paddling are expected the next day. You may be a little tired, both mentally and physically after your trip. Don’t plan any rough activities the same day! *Don’t be too scared to miss out on this great adventure! Whitewater rafting accidents are not that common, especially when considering how many people take them safely each year. According to America Outdoors, the numbers of deaths on commercial raft trips has ranged between 1 out of every 250,000-400,000 rafters. *Falling out of the raft can be a scary experience. Even though I fell in a calm section of the river, I was absolutely terrified and had a difficult time catching my breath. Listen to all instructions carefully! They will give you tips on how what to do should you fall in (grab on to the rope on the raft, float on your back with your feet up so you don’t catch a rock). It’s always a good idea to put safety first especially in a potentially dangerous activity. Don’t take the instructions too lightly. 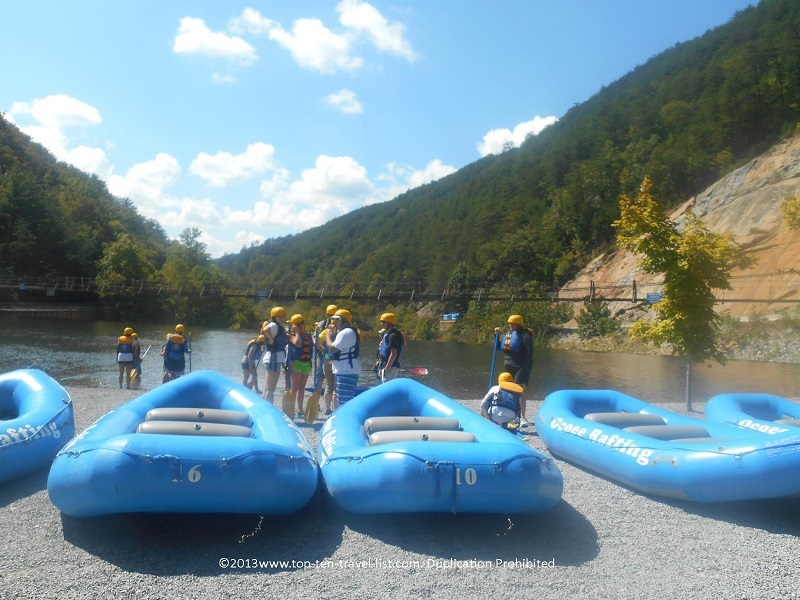 Wildwater Ocoee is located in Ducktown, Tennessee. Here is the exact address to put into your GPS: 4596 U.S. 64, Ducktown, TN 37326. Ducktown, Tennessee is within driving distance of many areas including Chattanooga (60 miles), Atlanta (119 miles), Knoxville (101 miles), and Blue Ridge ( 15 miles). Wildwater has 5 locations in the Blue Ridge and Smoky Mountains. Additional locations include: Chatooga in Long Creek, South Carolina, Pigeon in Hartford, Tennessee, Nantahala in Bryson City, North Carolina, and Asheville, North Carolina. Availability depends on the season. 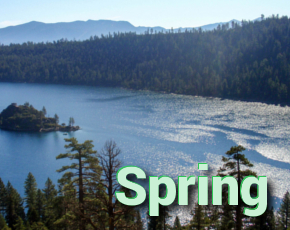 During the fall and spring months, only weekend trips are scheduled. During the summer, trips run 5 days per week. 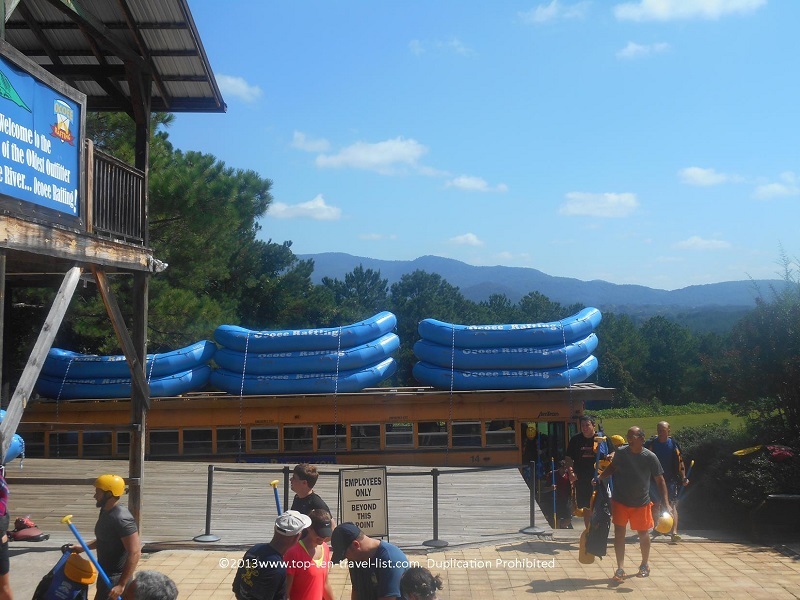 You can make your reservation online on the Wildwater website. Trip prices range from $36 to $100 per person. Prices also vary depending on the day and length of trip. A Thursday, Friday, Sunday, or Monday trip on the Middle Ocoee will cost you $45, while a Saturday trip will cost $50. Check out the full pricing schedule for both Upper and Middle Ocoee and combo trips. Blue Ridge, Georgia is a beautiful, quaint mountain town located just 30 minutes or so away. The town is home to a charming, historic downtown, plenty of individual shops and restaurants, and a number of beautiful rustic cabin rentals (Check out Mt. Laurel Cabin rentals). Mt. Laurel Cabins offer a variety of affordable rentals with great amenities, including: secluded surroundings, full size kitchens, decks facing the woods, fire pits, outdoor hot tubs, and scenic views of the forests and mountains. Blue Ridge Scenic Railway – A scenic hour long open air train ride takes you past the beautiful Toccoa River and the Appalachian Mountains. Total trip time is 4 hours, including a stop for lunch and shopping. Dining and shopping on downtown Main Street in Blue Ridge – Walking around Blue Ridge’s historic downtown is like taking a step back in time. Enjoy checking out eclectic individual shops like The Bear Store and quality restaurants and cafes like L & L Beanery Coffee Cafe and Harvest on Main. LongCreek Falls – A short 2 mile round trip hike leads you to a picturesque waterfall. This scenic hike is located in Blue Hills and is part of the Appalachian Trail. Adventure Trail rides – 1 – 1 and a half hour horseback rides are offered in Cherry Log, Georgia. Sunset and picnic rides are also available. Swan Drive In – A historic drive in theater in Blue Ridge – one of the few remaining in Georgia. Mercier Orchards – Enjoy the opportunity to pick your own apples and/or enjoy a delicious meal. Zip line canopy tours of Blue Ridge – Take the opportunity to enjoy 13 zip lines, all with beautiful views of the North Georgia mountain scenery. Brasstown Bald Overlook – Take the short, steep hike or the shuttle to the highest point in Georgia. Fantastic views, especially at sunset.